Epinium Analytics is the latest Amazon tool. Sell faster, sell easier, sell more. See a product demo entering an ASIN code in the box below. After including your external keyword research in Epinium, link your products with their keywords and organize them in groups. This will help you to take the most of our auto optimization system. 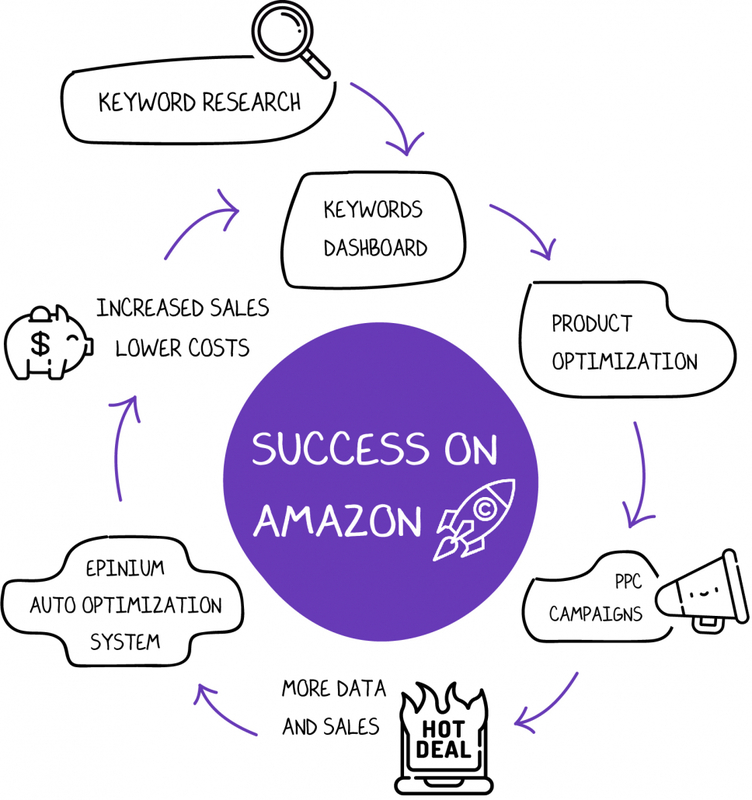 In Epinium, optimizing your products for SEO will be extremely intuitive and easy as you will be given different recommended practices for a perfect Amazon SEO optimization. Organic ranking is essential for your sales! We have implemented a whole new campaign manager to help you running profitable campaigns. Import your campaigns from your Seller Central or create new ones in Epinium, control and improve them with our tips! Your effort and our Auto-Optimization System makes the perfect couple. Your work is the fuel our algorithm needs to make magic. Our unique algorithm uses your campaign’s results to help you making decisions. All profitable keywords are automatically putted into its product search terms section ordered per importance and reliable performance. 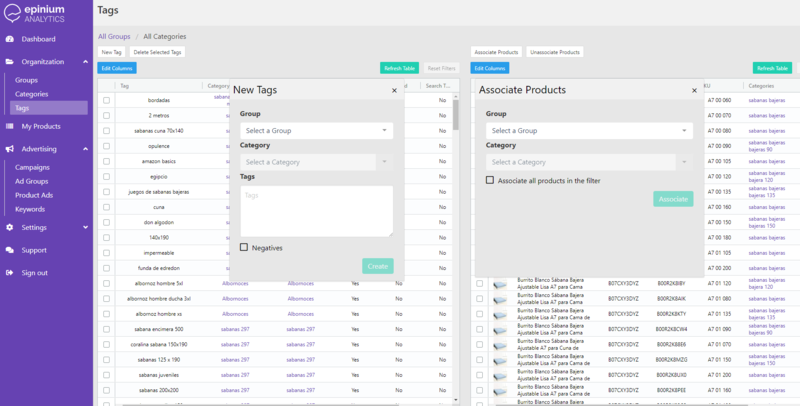 Organize your products per tags and groups before, create campaigns faster in Epinium, duplicate old campaign’s structures, adjust bids and make decisions with clear data and useful tips. 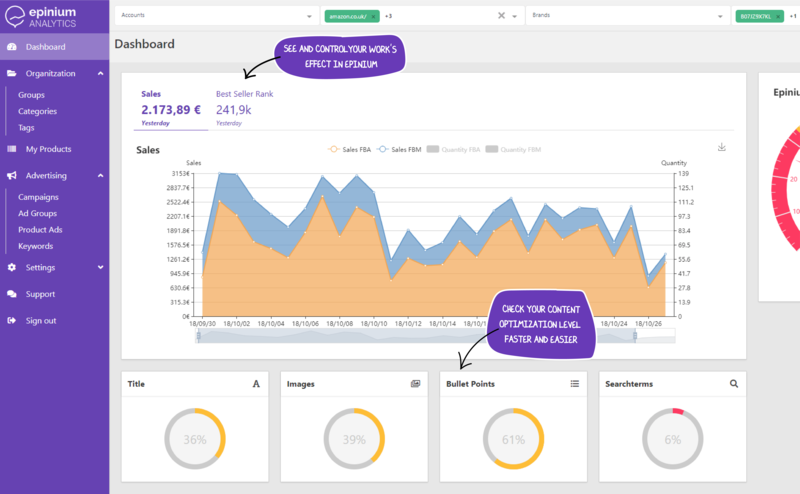 Get actionable insights about what aspects of your content need improvements in your own performance dashboard. Try to improve your Epinium Score! Include your external keyword research in Epinium and start optimizing your products. You’ll be able to edit them individually or in bulk by selecting more than 2 products. Forget about changing ASIN’s one by one and save a 60% of your time. 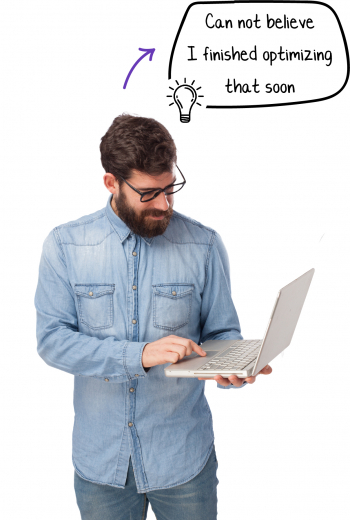 Once optimized for the first time, your products will always remain optimized at the point that search terms will be automatically and constantly renewed depending on their relevance.